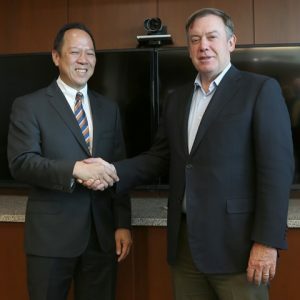 Honolulu – Leaders from Kamehameha Schools (KS) and Arizona State University (ASU) signed a Memorandum of Understanding (MOU) on April 11 to cooperate and advance education and sustainability. The partnership with ASU is another step toward KS’ strategic goal of contributing to our communities’ collective efforts to kōkua educational systems throughout Hawai‘i. One focus of ASU’s Julie Anne Wrigley Global Institute of Sustainability is to prepare educators and leaders with a rich understanding of how diverse fields such as humanities, the sciences, design, and policy can be integrated to form a more sustainable society. Under the MOU, both organizations agree to encourage and promote cooperation in key areas within a portfolio of initiatives. Such areas include research and innovation, long distance learning, philanthropic funding and advancement, student enrollment, persistence and completion. Areas of academic priority include education, sustainability fields and STEM. One early example of the three-year pilot program will allow KS and ASU to leverage the resources of both educational institutions – ʻāina and innovation – to train Hawai‘i’s teachers to use land-based teaching solutions for sustainability within their indoor and outdoor classrooms. Training is provided through a blend of in-person and online instruction. The first phase of the collaborative effort will include a select group of teachers across the state’s educational grid, from charter schools and Hawaiian language immersion to the Department of Education and Kamehameha’s three campuses. “Their innovative online training platforms and technology are some of the best in the world in training teachers effectively, and enabling learners with interactive, exploratory learning,” said Kā‘eo Duarte, Kamehameha Schools’ VP of Community Engagement and Resources. “The ultimate outcome both ASU and KS are striving for is wellbeing. We realize that our goal, to help elevate the wellbeing of Native Hawaiian students and all of Hawaiʻi’s learners and families, cannot be done alone. A lot of the issues we face in Hawaiʻi are shared by other communities and will not always be solved locally. Part of that is looking to strong national thought partners with the platform and tools already in place, that can support the advancement of our Lāhui in this generation,” he added. ASU is the newest formalized educational partnership for KS, following agreements made with the University of Hawaiʻi and Chaminade University of Honolulu earlier this school year. Each partnership helps solidify KS’ path toward working with others to help improve educational systems in Hawai‘i and to execute as a high-performing Native Hawaiian organization – major goals of its strategic plan, Kūhanauna. These initiatives to collaborate with colleges and universities also help meet key learning milestones that have been determined by mutual priorities of KS and communities statewide, including the nine regions Kamehameha seeks to support and elevate. U.S. News and World Report ranked ASU number one in the United States in innovation in 2016, ahead of Stanford and MIT. According to Diverse: Issues in Higher Education magazine, ASU ranked 1st in the nation for doctoral degrees and 10th in the nation for undergraduate degrees in education awarded to Native Americans last year. ASU’s Mary Lou Fulton Teachers College ranks 14th nationally and 7th among public universities, according to U.S. News and World Report. Photo caption: ASU president Michael M. Crow (with visor) and KS CEO Jack Wong review a new MOU between the two educational institutions. Looking on are ASU and KS leaders, including KS vice president of Strategy and Innovation Lauren Nahme and KS vice president of Community Engagement and Resources Kaʻeo Duarte. Photo credit: Philamer Batangan, ASU Foundation for a New American University.